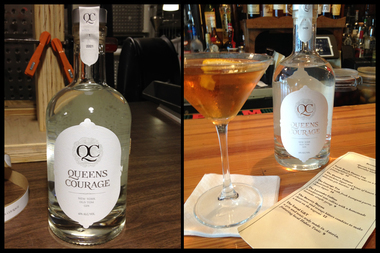 The Astoria Distilling Company's Queens Courage Gin is now for sale at Astoria Wine and Spirits, and is available at local bars Bourbon and Vine and Bowery Bay. QUEENS — A neighborhood-inspired distilling company's gin is hitting the shelves in Astoria this week, and being served up in cocktails at two local bars. The Astoria Distilling Company, founded by local resident Chris Murillo, is bringing its first product to the masses — Queens Courage, an 'Old Tom' style gin that's made with New York grains and slightly sweetened with locally-sourced honey. Bottles of Queens Courage will now be on sale at Astoria Park Wine & Spirits, at 28-07 24th Ave., where Murillo will be holding a free tasting Thursday from 6:30 to 8:30 p.m.
"I'm thrilled that our first retail liquor store account is with Astoria Park Wine & Spirits, a local family-owned Astoria business like our company," the founder said in a statement. Though Queens Courage is currently produced at a partner distillery in upstate Rochester, Murillo's goal is to open his own space in western Queens. Locals can also sample the new gin at two neighborhood bars: Bourbon and Vine at 36-05 30 Ave. and Bowery Bay, located at 19-33 Ditmars Blvd., which is offering six cocktails featuring Queens Courage.